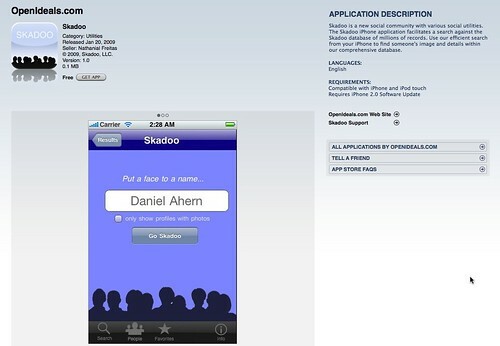 Skadoo is a PhoneGap based application that is now available in the iTunes store. The app should be considered very beta… though (developers take note!) Apple doesn’t allow you to include the word “beta” in any graphics, description or application meta-data. The full server app is still under development (server queries are VERY slow), but in short, it is a “people” search engine, for finding various profiles of someone online based on searching for their name. I, through my work with Oliver+Coady, was hired to build the iPhone App and get it into the App Store ASAP. PhoneGap was the best solution to get the job done quickly. Development time was < 1 week... .it took longer to get the app into the store than it did to build it! The app uses JQuery for server interaction and the UI was built in Dashcode. Another quick interesting thing about this app, is that it uses HTML 5 Database to persist search results and Safari/Webkit extensions for CSS translation and transitions. Both working pretty well, though the translations are about 4x faster on the iPhone Simulator than on my iPod Touch. Get Skadoo for your iPhone today! That’s a pretty impressive turnaround. PhoneGap doesn’t scrape, it just provides a native wrapper to the WebKit component on the iPhone. You launch the app and point it any URL you’d like. Any offline, cacheing behavior would have to be built by you or through some sort of module in Drupal.